Researchers have used fishing line fiber and sewing thread to create inexpensive artificial muscles. The inexpensive, artificial muscles generate far more force and power than human or animal muscles of the same size and could be used in medical devices, humanoid robots, prosthetic limbs, or woven into fabrics. "In terms of the strength and power of the artificial muscle, we found that it can quickly lift weights 100 times heavier than a same-sized human muscle can, in a single contraction," says University of British Columbia Electrical and Computer Engineering professor John Madden. "It also has a higher power output for its weight than that of an automobile combustion engine." Madden and colleagues used high-strength polymer fibers made from polyethylene and nylon, the common materials in fishing lines and sewing thread. 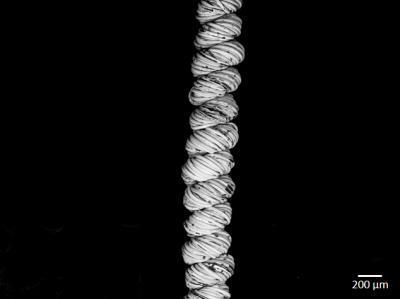 The fibers were twisted into tight coils – like you would twist the rubber band of a model toy airplane – to create an artificial muscle that could contract and relax. The artificial muscles contract and relax in response to changes in temperature, which can be controlled by an electrical heating element. This system has been demonstrated by using such muscles to manipulate surgical forceps. The artificial muscles may also find use in robots and low cost devices that help those with impaired mobility, the researchers say.